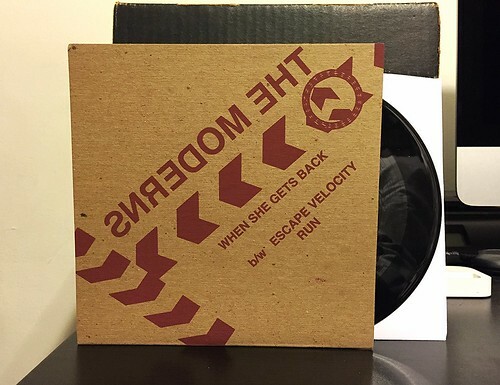 I Buy Way Too Many Records Dot Com: The Moderns - When She Gets Back 7"
So I can't pretend to know a lot about the history of this 7", but in a nutshell this was recorded some 35 years ago and best I can tell was never released. UT records has corrected that tragedy and thank goodness they did, as losing these songs forever would have been a real shame. 70s - 80s power pop can be a dicey thing for me sometimes. While I virtually always like it, I'm not often completely blown away by anything. Then, I watch other people, whose musical taste I really respect, go crazy for something and I'm left feeling like I just don't get it. Well, this is not a problem for me with The Moderns. I definitely get this. I'm especially glad that UT records sent this to me to review. I honestly don't know if I would have ever known how much I'd like it if left to my own devices. On this 7" are 3 songs worth of upbeat, clean guitar driven pop songs. There's a slight amount of echo on the vocals (as bands were wont to do back then), but other than that the production is very strong and all 3 songs are quite catchy. These songs remind me a lot of Gentleman Jesse (for a modern reference) meets The Vacant Lot (for a dumb, not so modern reference that's probably not all that helpful to a lot of people). Regardless, all 3 songs are top notch and if power pop is your bag, this 7" should be that bag.